Your troubles can add up until all you see is a mountain of woes. Your heart just doesn't seem like it can take anymore. I think most people reading this will connect with what I'm saying. In this day and age of what's happening in the world, with the economy bruised and broken, lay-offs around every corner it can build that mountain before you know what has hit you. 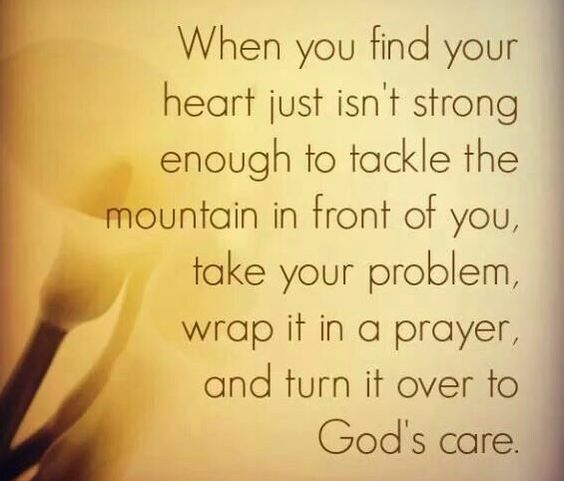 There is one part of the puzzle that the quote doesn't cover and that is when you do this you must totally turn all your cares over to God on the issue. You see it's simple to believe in God and say a prayer. What is not so simple is to totally trust in God. 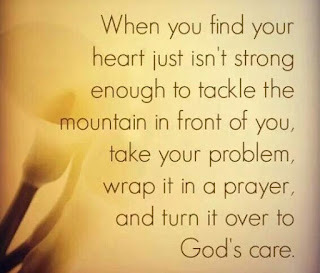 If you can't totally turn over you trust in God on the problem then he can't help you. He can't help you because you will not relinquish your control over the matter. It is kind of like you trying to take off in a boat with the boat still tied at the dock. Give all over to him, you can always trust God. If you enjoy my post please share them. If you know someone needing hope send them to my blog.